The Cell Biology in Environmental Toxicology (CBET) research group at the Plentzia Marine Station and the UPV/EHU's Department of Zoology and Animal Cell Biology has broad expertise in detecting the changes taking place in the health of ecosystems by measuring chemical variables and other sets of parameters in the cells and tissue of mussels, bivalves and fish. "These variables are like our temperature or pulse; the fact that they change in some way indicates that something is going on," explained Ionan Marigómez, director of the Plentzia Marine Station and professor of cell biology in the CBET group. 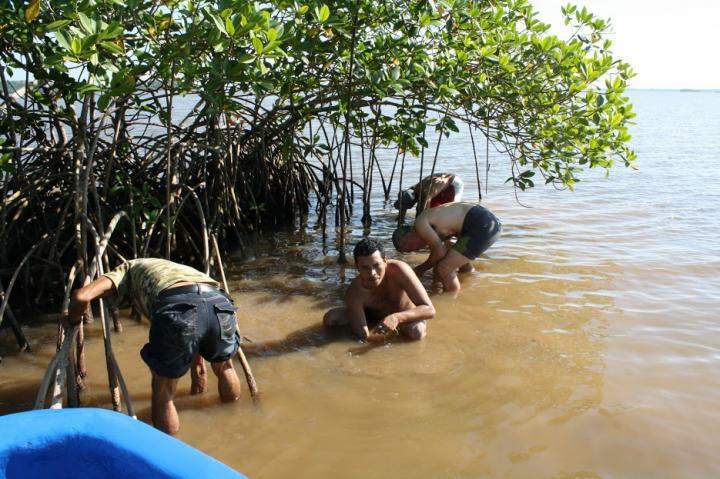 In collaboration with the National Autonomous University of Nicaragua, the UPV/EHU's research group tackled the study of bivalves that could act as indicators of the environmental status of the Nicaraguan mangroves, both on the Caribbean and the Pacific. When considering the environmental status of tropical areas, "there is much awareness about the deterioration of the coral reefs, whereas focussing on the health status of the mangroves is less widespread. But the mangroves protect the reefs, they regulate sedimentation and the nutrients that come from the land, and are the hatcheries of many reef species", explained Marigómez. In the specific case of Nicaragua, "pollution is not very high, but there are various risk factors: the mangroves receive, among other things, the pesticides of all the crops, or mercury that is discharged in gold mines. What is more, there is no water treatment", he went on. One of the best candidates for monitoring mangrove ecosystems is the Crassostrea rhizophorae oyster. Yet, as Marigómez explained, "they are only found in the mangroves on the Caribbean coast, not in those of the Pacific; so we wanted to find substitute species for the sentinel work. And we also found it necessary to look for another additional species for the mangroves on the Caribbean side. Each species has a different sensitivity when faced with pollutants, so conducting the biomonitoring with more than one species at the same time is advisable". Despite having broad expertise in tasks of this nature, Marigómez remarked that in Nicaragua they were unable to use the usual techniques and methods. "It is another world, and they have very strict rules; for example, to get to the sampling locations we had to use light aircraft or motor launches. What is more, the use of liquid nitrogen and dry ice is expressly forbidden, and our working methodology is mainly based on cryotechniques; we are obliged to transport the samples in a frozen state. So in terms of logistics, adapting our working methodology to that reality posed a major challenge for us." "The work done was a lovely starting point, and it has encouraged us to set up another piece of research later on. For the monitoring we found a very suitable large cockle, L. grandis, which in Central America is known as casco de burro (donkey's hoof). It has a long life, so it would correctly reflect the evolution of the location where it lives and, what is more, has a very interesting biogeographical distribution: from Baja California to Ecuador. It would be nice to do this if we could secure long-term funding, and set up a network to monitor the whole biogeographical region." The ultimate aim of the monitoring is to be able to manage and protect the environment. "In Europe the wellbeing and use of ecosystems is governed by two directives, one on water and the other on marine strategy, and both stipulate the need to monitor the ecosystems to find out what state they are in at all times. Yet in other regions of the world, including Latin America, the legislation on environmental protection is not so developed. But in its capacity as the creator and member of the Iberoamerican Society of Contamination and Environmental Toxicology, our group has contacts with various Latin American centres of research and universities, and our aim is to gradually overcome the existing technical problems so that the monitoring can be something global". Javier R. Aguirre-Rubí, Maren Ortiz-Zarragoitia, Urtzi Izagirre, Nestor Etxebarria, Felix Espinoza, Ionan Marigómez.